These caramels are adapted from the recipe, "Granola Chews" in the book, Breaking the Vicious Cycle. Add a crust and take out the raisins, I'm pretty sure it's a Pecan Pie! Heat the honey and butter together until the butter is melted and the two are well mixed. Add the almond flour, salt, pecans and raisins. Mix well and pour into a parchment-lined 8 inch square glass dish*. Cool for 1 hour or chill in the fridge, remove from the dish by lifting up the parchment paper. 1. Cut two 8 inch wide strips from the roll of parchment paper. 2. 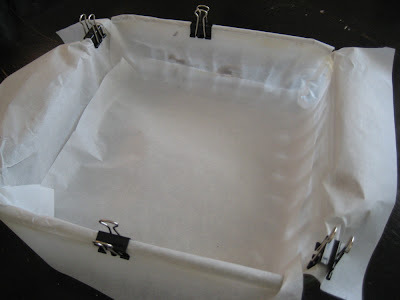 Lay one in the dish and push down to fit, use two clips on the edges to hold paper in place. 3. Lay the other strip of paper across the first, and repeat. 4. 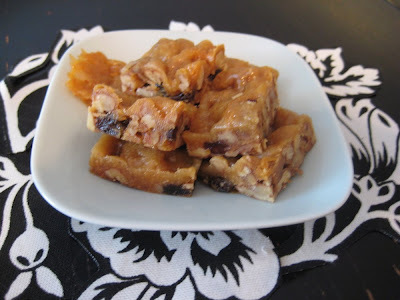 Pour the caramel mixture in the dish and remove the clips before baking. 5. This will ensure that no caramel gets permanently stuck to the glass dish and allows for easy removal and cutting.